The number of medical seats in different countries of the world and more so in India has not kept pace with huge demand, which has led to higher tuition fees and increased competition, virtually making it impossible for many talented students to pursue their medicine studies. There has been a significant increase in the number of students and their parents interested in the possibility of studying medicine in Europe. Medical Universities in Europe are known around the world for offering top-rated medical education and training with affordable tuition fees and comparatively low living cost. The European medical universities have centuries of prestigious legacy and have produced some of the leading physicians and doctors in the world today. Though there are many countries in Europe that offer medicine studies countries like Bulgaria, Hungary, Ukraine, Poland, Lithuania and Latvia stands tall as some of the most preferred medicine study destinations in Europe. Bulgaria’s worldwide reputation for high quality medical education is built on its solid commitment to excellence and foundations of exceptional medical research. Bulgaria being an EEA country, its medical degree is recognized globally and enjoys a high reputation in the medical community hence a doctor who has attained his medical qualification from Bulgaria need not undertake any exam such as the UKMLA to practice as a registered doctor in UK. The high prestige of Bulgarian Institutions combined with its particularly low cost of living, render Bulgaria as an ideal destination for students looking for quality medicine studies abroad. Being one of the safest countries in Europe, parents can feel relaxed about the safety of their children. Some of the well-known universities such as University of Pleven and University of Sofia are amongst the most sought after Universities in Bulgaria for pursuing Medicine studies. Hungary is fast emerging as a potential destination for medicine studies among those aspiring to study medicine abroad. The relatively relaxed admission requirements and reasonable tuition fees make Hungary a highly desired medical study destination for many students especially from India. The medical degrees offered by Hungarian medical institutions are recognized worldwide, most importantly by the European Union and the United States, a main reason why scores of International students throng to study medicine in Hungary. A Bulgarian educated Indian doctor can practice in India after clearing the mandatory Medical council of India screening test for foreign educated doctors. All these factors combined with its particularly low cost of living, render Bulgaria as an ideal destination for students looking for quality medicine studies abroad. Being one of the safest countries in Europe, parents can feel relaxed about the safety of their children. Some of the well-known universities such as University of Pleven and University of Sofia are amongst the most sought after Universities in Bulgaria for pursuing Medicine studies. Ukraine is at the forefront of providing quality medical education at economical costs. It has a highly developed health care system that adopts practical teaching approach, which makes it easier for students to grasp the concepts. The faculties at Ukrainian medical institutions have years of experience and global exposure. Medical degrees offered by Ukrainian institutions are recognized across the globe. For an Indian student on successful completion of the course he/ she can appear in the MCI screening test for gaining MCI registration, which is mandatory for practicing in India. Poland is a country worthy of mention for its immense modernity and dynamism of its medicine programs. There are 12 public medical universities in Poland offering medicine programs in English for international students, large number of international Students aspiring to studying medicine throng to Poland for its appealing curriculum, reputation for offering top notch medical education. Medicine programs offered by polish universities /institutions are in tune with the rapid changes in the domain which makes polish educated doctors the most sought after professionals throughout the world. Lithuania is at a crossroad between west and east Europe with deep respect for traditions and robust passion to learn and innovate. Hundreds of students from around the world take up medicine studies in Lithuanian universities every year. There are More than 11 Medical schools in Lithuania offering medical programs in English. A bachelor in Medicine takes 4 years to complete in Lithuania. Medical universities in Lithuania aim at equipping potential doctors with adequate knowledge of science, good understanding of medical procedures and sufficient knowledge of clinical disciplines. Courses offered by accredited Lithuanian universities are recognized across the globe. Aspirants need to have a minimum score of 6 in IELTS, a minimum score of 550 In TOFEL paper based score or a score of 80 in the TOEFL internet based test. Owing to the high standard of the programs, doctors who graduate from Lithuanian universities can carve a globally successful career. Latvia, well placed in central Europe is the member of European Union as well as the Schengen group and is a safe country known for being welcoming to International students. Most of the medicine programs offered by Latvian universities, colleges are accredited and recognized nationally and internationally for the quality of their teaching and research. Medical students in Latvia follow the same syllabus as the one in Indian medical universities. Studies and practical’s are done under the guidance of knowledgeable professors making one acquire up-todate knowledge and skills to become world class doctors capable of being employed in prestigious institutions and organizations all over the world. The degree conferred is MD (Medical doctor) which is the same as MBBS There are also ample opportunities to continue further studies in the areas of their interest take up medicine studies in Lithuanian universities every year. There are More than 11 Medical schools in Lithuania offering medical programs in English. A bachelor in Medicine takes 4 years to complete in Lithuania. Medical universities in Lithuania aim at equipping potential doctors with adequate knowledge of science, good understanding of medical procedures and sufficient knowledge of clinical disciplines. Courses offered by accredited Lithuanian universities are recognized across the globe. Aspirants need to have a minimum score of 6 in IELTS, a minimum score of 550 In TOFEL paper based score or a score of 80 in the TOEFL internet based test. Owing to the high standard of the programs, doctors who graduate from Lithuanian universities can carve a globally successful career. Santa Monica Study Abroad with an successful track record of over 13 years, work with select number of accredited and reputable European Universities that offer best medical education in English-language, which are recognized internationally. 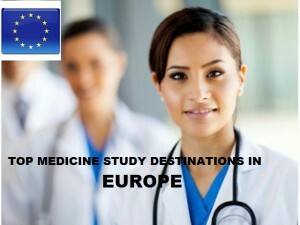 For more information on Medicine programs in Europe reach us on 0484-4140999. This entry was posted in study medicine in Europe on February 9, 2016 by Ronnie Fredrick Thimothy.